Huge thanks to Complex for covering The Hip Hop Architecture Design Cypher I hosted at Autodesk in San Francisco back in February 2018. 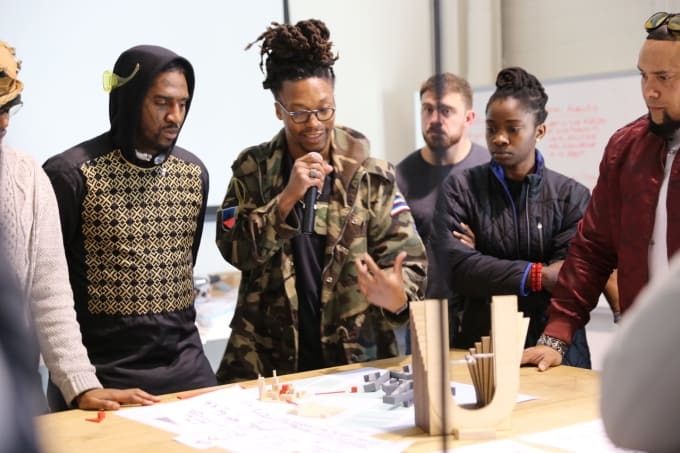 The Design Cypher is based on the curriculum of The Hip Hop Architecture Camp® and challenged some of the top lyricists in hop hop to join some of the top young design minds in architecture to come together and create designs in a fast paced, cross disciplinary environment. The artist included Lupe Fiasco, ChinoXL, Daylty and Nikki Jean, architects and designers included Michael Ford, (The Hip Hop Architect), Bryan C Lee Jr, Jason Pugh, Pascale Sablan, and Julia Weatherspoon. The Hip Hop Architecture Camp's Design Cypher is a design process created by Michael Ford, The Hip Hop Architect, focusing on the intersection of theory and practice, which challenges participants to explore hip hop culture as a revolutionary approach to understanding, conceiving, and generating architecture.